It’s been two months since I’ve last written a bon mot. My dear twitter pal OpinionsToGo tweeted me today to say, “Waiting with bated breath for another of your interesting #bonmots”. I thought…me too! Then I thought, bated breath? Where the heck does that come from? I always picture a panting dog when I hear this phrase. I’m sure this has nothing to do with the panting dog, Claire sitting next to me whilst I write. Anyway…you probably know bated breath means, “Breathing that is subdued because of some emotion or difficulty” (as The Phrase Finder states). But let me ask this, did you think this phrase was spelled baited breath? Shame on you! (and me…I might have thought it was spelled that way) But according to World Wide Words, “Bated here is a contraction of abated through loss of the unstressed first vowel (a process called aphesis); it means “reduced, lessened, lowered in force”. So bated breath refers to a state in which you almost stop breathing as a result of some strong emotion, such as terror or awe.” Suffice to say, don’t use “baited”. It’s wrong. There’s a lovely little poem about a cat, some cheese scented breath, and a mouse hole. It explains why you don’t want to say “baited breath”. 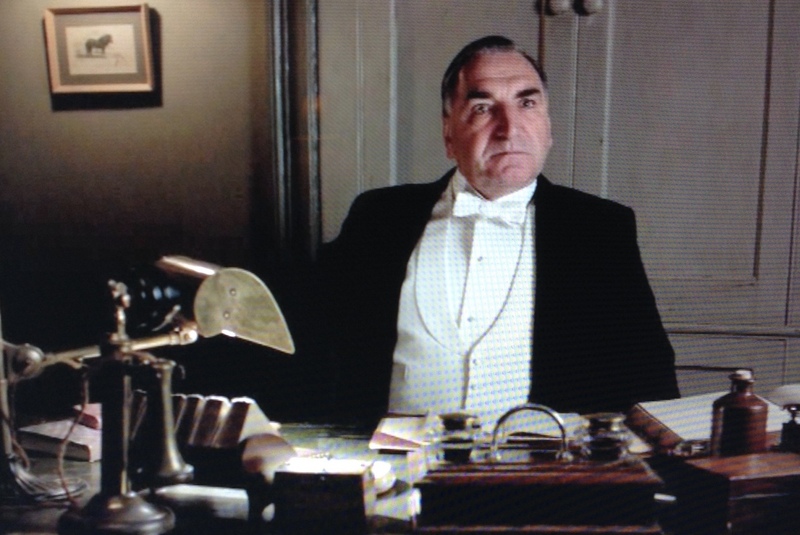 And now we come to Carson, the butler from Downton Abbey and why his is the image I’ve selected to accompany this. Tonight, just at the moment I was setting aside my glass of wine and reaching for my laptop to write this post, on my television Carson uttered the phrase, “I shall wait with bated breath.” I was gobsmacked, which as fate would have it was another bon mot suggested by OpinionsToGo. Isn’t she something? I await your comments with bated breath. Thanks Sue, I so enjoyed that. I won’t say the obvious about waiting for the next one. Can’t believe you wrote this amazing piece so quickly. I loved it! Your use of Carson as an example was brilliant! You are getting really good at this whole #bonmot thing! How odd! I had the exact same reaction last night while watching. Since I pay no attention to spelling, ever, I thought perhaps bated breath had something to do with dogs used in scent work. This morning I was thinking that I had not had a post from you in quite a while. Glad to see it!